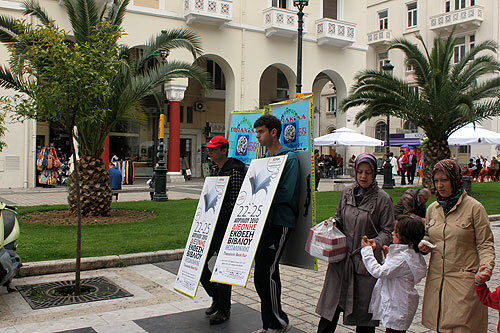 Reading the dailydooh article about the digiwalkers on Saturday at the Business Design Centre in Islington, London, it was impossible for me not to laugh, since the same day in my hometown, Thessaloniki, Greece in the main square, Aristotelous we had a totally different picture. I guess that the difference is that we are now under IMF’s and EU’s supervision and digital era is becoming science fiction for Greece. Do you like the view from your window ? Who wants to look outside at the same backyard all the time ? The folks at Rational Craft sure don’t, so they’re building Winscape, a “faux window” system that can be controlled with a Wii remote and iPhone app. Rational Craft also features a scenery site with more scene options for owners and tips for shooting and composing your own footage. Rational Craft is targeting an eventual Winscape hardware and software kit price, sans Mac Pro, of $2,500-3,000. Web tools allowing simple content upload and management – via the Web. In addition, C-nario Messenger 3.4 supports the Windows 7 operating system. The new C–nario Messenger 3.4 comprises new web tools allowing simple content upload, scheduling, approval and delivery. Users can use the new version according to their role and authorization level. The Web tools allow simple access via the Web. One of the Web tools is C-nario Local Web Editor, which enables local control via the Web over a designated zone in the template/layout. A new permissions module is used to define users, roles and their associated access level. Authorized users can update video, images, text, flash, audio and RSS on pre-defined windows. Users can schedule content and arrange playlists inside accessible windows using a new automated, rule-based scheduling module. C-nario Messenger 3.4 includes advanced Web Feed Reader, allowing replacement of video files, based on tags, scripts or low-resolution files. In addition, it can easily parse XML data feeds, using very simple scripting, resulting in a quick and reliable scripting, which leads to a very fast and simple integration of dynamic data feeds. 3D Television is the next big thing . In this video-commercial from Samsung you’ll see in a funny way what is all about!! Are you fed up with multi-touch screens? How about multitoe floor? An entire floor to practice your foot-based inputs on? Researchers at Potsdam’s, Germany, Hasso Plattner Institut have put together a multitouch floor that recognizes individual users by their shoe pattern and responds to such universally familiar actions as stomping your feet and tapping your toes. We based our design on frustrated total internal reflection because its ability to sense pressure allows the device to see users’ soles when applied to a floor. We demonstrate how this allows us to recognize foot postures and to identify users. These two functions form the basis of our system. They allow the floor to ignore inactive users, identify and track users based on their shoes, enable high-precision interaction, invoke menus, as well as track heads and allow users to control several multiple degrees of freedom by balancing their feet. I think that the time that the stores would begin their ads by “reading” our toes is not far away. Digital Signage at your toes. Sharp during CES was the only one, between the big constructors of TV sets, that didn’t announced a 3DTV. Trying to catch-up, they’ve unsurprisingly announced that they’re working on 3DTVs for a Japanese launch this summer. Other countries will follow after the Japanese retail launch. If you ask me, I will wait when somebody invents an apparatus like the 3DTV in Paycheck as it is seen at 00:00:20″ of the following trailer. For those who don’t know Eyefinity , its a technology from AMD that first appear in September 10, 2009. This technology supports grouping of multiple monitors into a “single large surface” (SLS), treated by the OS as a single monitor with very high resolutions, as an inexpensive alternative for ultra-high resolution display solution. First edition VGA cards from AMD supports maximum 3 monitors . So if you combine 4 cards in a single computer you can get 12 monitors . This is amazing. But if i tell you that you can have 24 monitors on a single pc ??!!! 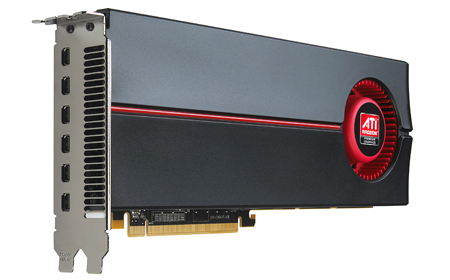 Here it is,the Radeon HD 5870 Eyefinity 6 Edition. This single card can support six monitors with display port connection . It haves 2 GB GDDR5 RAM with dual DAC’s and its a MONSTER. So as i say before, imagine combine again four of this cards. You get a video wall that you can use with your Digital Signage software! !